This week I completed my version of Christina Hadderingh's Hotel of Bees Shawl and I am SO happy with it. One of my regular Friday afternoon workshop attendees went for a class at Hill Country Weavers in Austin, Texas and she spent I can't remember how many hours learning about how to make this shawl. Several months later she hadn't started the shawl. It's quite an involved pattern which requires some concentration and lots of counting so it's maybe not ideal for a lively group workshop setting. But anyway when I heard Claudia on her Crochet Luna podcast talk about the Hotel of Bees crochetalong that Sandra from Cherry Heart and Sam from Betsy Makes were organizing I thought this was a great way to get my friend going with her project and obviously I had to join her so that I could help with any queries along the way. I absolutely loved the pattern because it is comprised of many different techniques - cute puff stitch for the bees, overlay technique for the wings and fillet crochet for the honeycomb pattern. I enjoyed the challenge of all that counting. It's also a shape that I like. I like my wear my shawls around my shoulders with a knot at the front or the corner so not every shawl works this way. 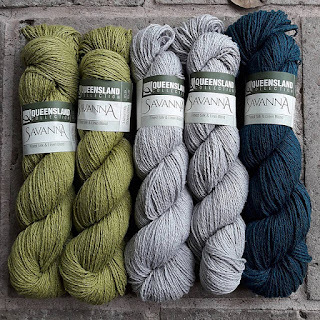 My yarn choice was Queensland Collection Savannah which is a linen/silk mix. I was a bit worried because it's not soft BUT it's not scratchy either. I haven't used linen before to make a garment. It's starting to get quite hot here in Houston. Wool just doesn't work. Anyway I wore the shawl into work on Wednesday, a rather hot humid day and I am happy to report that it felt great! 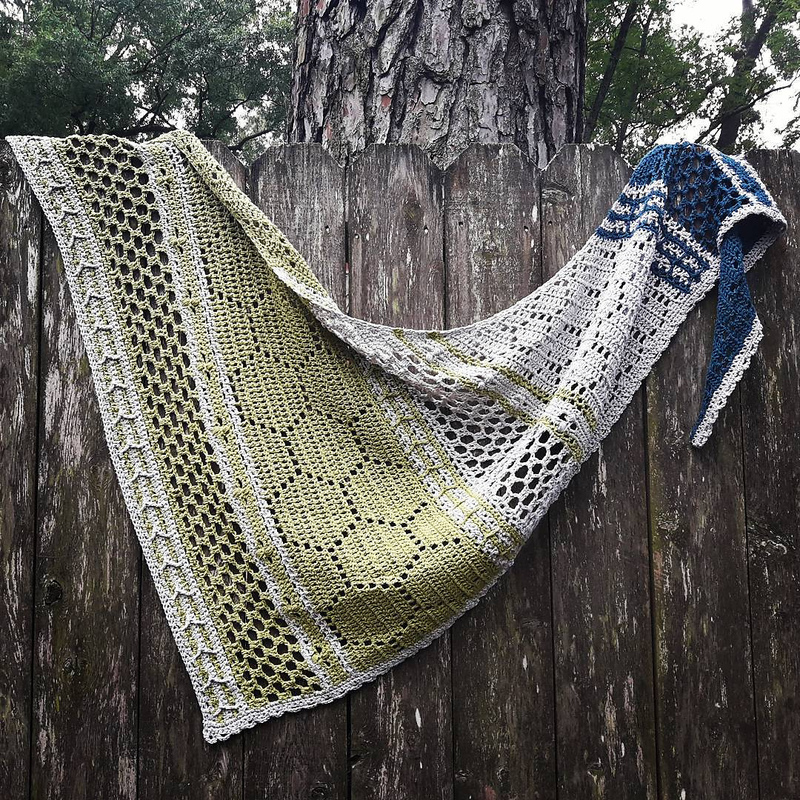 I think people will be seeing rather a lot of my Hotel of Bees Shawl this summer! Anyway do go have a look at all the marvellous Hotel of Bees shawls on Ravelry. There are 355 projects to look at as I write this. And/or check out #hobcal on Instagram if that's your thing. I would highly recommend that you make it too! Love love your Hotel of Bees shawl .It is very very classy if I can use that word and so beautifully patterned with the honey comb shapes and other intricate designs and delicate colours chosen. Thank you Helen!! I am looking forward to seeing your version of the shawl. It's such a wonderful pattern. It's no wonder so many people have made it. I do like every version I've seen of this pattern. I agree Jodie! Every one looks wonderful. It's a marvellous design! I'm going through old e-mails and found here's another post I didn't see earlier, lol. Anyway I just wanted to say that WOW this shawl is gorgeous! You should be very proud of it. What a stunner! Thank you Nicole!! I just couldn't resist joining in with the CAL. It was one of my most enjoyable makes.